Association for Democratic Reforms (ADR), in its earlier report dated 8th January, 2014, specified that various sectors of business houses in 8 years, between FY 2004-05 & 2011-12, donated a total of Rs 378.89 cr to National Parties, constituting 87% of the total contribution from known sources of political parties. 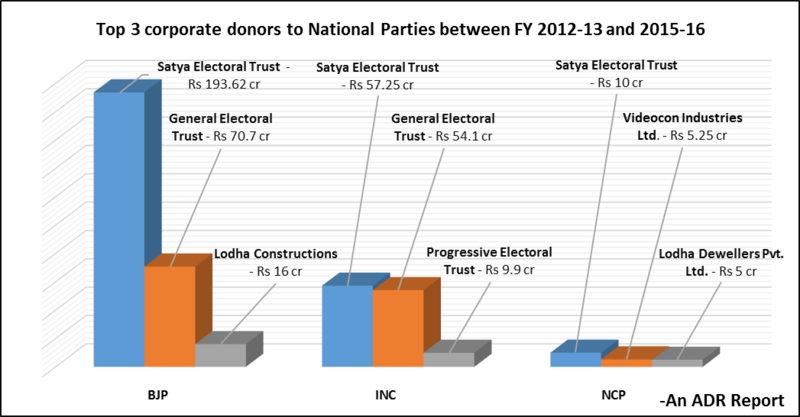 This report analyses the donations from corporates to National Parties between FY 2012-13 and 2015-16.
a) Out of the 5 National Parties, BJP received the maximum donations of Rs 705.81 cr from 2987 corporate donors followed by INC which received a total contribution of Rs 198.16 cr from 167 corporate donors. b) Between FY 2012-13 and 2015-16, BJP’s and INC’s voluntary contributions above Rs 20,000 from corporate/business houses is 92% and 85% respectively. c) CPI and CPM have the lowest share of corporate donations at 4% and 17% respectively. a) National parties have received the maximum corporate donations in the FY 2014-15, during which Lok Sabha elections were held. b) Corporate donations received in FY 2014-15 alone forms 60% of the total corporate donations received between FY 2012-13 and 2015-16.
c) Donations from corporates to National Parties reduced by 86.58% between FY 2014-15 and 2015-16.
a) Despite not donating during FY 2012-13, Satya Electoral Trust was the top donor to three of the National Parties, between FY 2012-13 and 2015-16. The Trust donated a total of 35 number of times in 3 years, amounting to Rs 260.87 cr. b) BJP declared receiving Rs 193.62 cr while INC was the recipient of Rs 57.25 cr of funds from the trust. NCP received Rs 10 cr from Satya Electoral Trust during the same period. c) General Electoral Trust, which was formed before the Electoral Scheme was launched by the Government in 2013, was the second highest corporate donor to BJP and INC. Between FY 2012-13 & 2015-16, the Trust donated Rs 70.7 cr and Rs 54.1 cr to the two National Parties, respectively. d) CPI and CPM: The top donors to the Communist parties were ‘Associations’ or ‘Unions’. CPI received a total of Rs 14.64 lakhs from 15 different associations/ unions while CPM received a total of Rs 1.09 cr from 7 different associations. a) The contributions from corporate/ business houses have been divided into 14 sectors by ADR and does not form a part of the submission made by parties to ECI. The sectors include Trusts & Group of companies, Manufacturing, oil & power, mining, construction, exports/imports, real estate among others. b) A total of Rs 956.77 cr was donated by all the corporate/ business houses to the 5 National Parties between FY 2012-13 and 2015-16.
d) Donations from Electoral Trusts to National Parties between FY 2012-13 & 2015-16 is given in Annexure – 2.
a) The real-estate sector was the biggest donor to the National Parties during FY 2012-13, contributing a total amount of Rs 16.95 cr to the parties. BJP received the highest contribution of Rs 15.96 cr followed by INC with Rs 95 lakhs and CPM with Rs 4 lakhs. b) Trusts and Groups of Companies with varied interests in mining, real-estate, power, newspapers etc., donated the highest amount of Rs 419.69 cr, between FY 2013-14 to 2015-16, to the National Parties. c) Between FY 2012-13 & 2015-16, manufacturing sector was the second highest overall contributor, contributing a total of Rs 123.67 cr to the 5 National Parties. a) BJP, INC and NCP, all three received the maximum contributions from Trusts & Group of companies. BJP received the highest, Rs 287.69 cr from Trusts & Group of companies, followed by INC with Rs 129.16 cr and NCP with Rs 15.78 cr. b) BJP received the highest donations from all 14 sectors including Real-estate (Rs 105.20 cr), Mining, construction, exports/ imports (Rs 83.56 cr), Chemicals/ Pharmaceuticals (Rs 31.94 cr) etc. 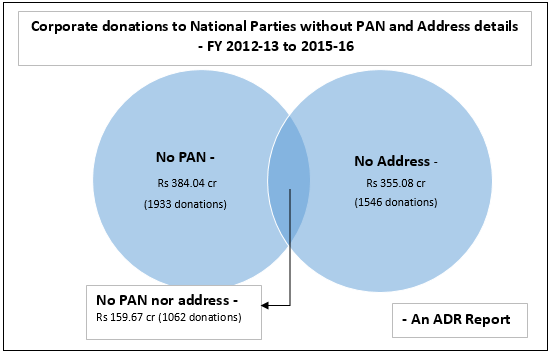 a) A total of 1933 donations through which national parties received Rs 384.04 cr do not have PAN details in the contribution form. b) National parties have received Rs 355.08 cr from 1546 donations which do not have address details in the contribution form. c) 99% of such donations without PAN and address details worth Rs 159.59 cr belong to the BJP. a) Political parties reported receiving 262 donations worth Rs 10.48 cr from such corporate entities who have zero internet presence or if they do there is ambiguity about the nature of their work. 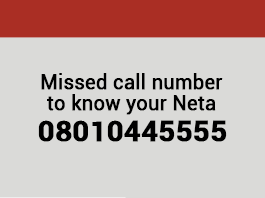 b) Contact details of most of these companies were unavailable in cases where they were visible online. The Supreme Court gave a judgment on 13-09-2013, declaring that no part of a candidate affidavit should be left blank. Similarly, no part of the Form 24A submitted by political parties providing details of donations above Rs 20,000, should be blank. All donors who have donated a minimum of Rs 20,000 as a single or multiple donations should provide their PAN details. Date on which the donation was made should be recorded by the party and submitted in Form 24A. Any party which does not submit its donation statement to the ECI on or before 31st Oct should be heavily penalized and its income should not be tax-exempted. A total of Rs 159.67 cr was collected by the National Parties from 1062 corporate donors without obtaining their PAN and Address details. Such incomplete contributions reports must be returned to the parties by the ECI, to deter them from providing incomplete information. Corporates should make details of their political contributions available in public domain through their websites (in annual reports or in a dedicated page) for increasing transparency in political financing. Annual scrutiny of donations reports of National, Regional and unrecognized parties should be initiated by a dedicated department of the CBDT, to discourage donations from shell companies or illegal entities.